Ninjaman remains in the hospital but his high profile murder trial is proceeding without him. The dancehall legend was rushed to the hospital on Friday after collapsing in court from a suspecting heart attack. The judge adjourns the trial until Monday, but the artist was unable to attend court. His attorney, Valrie Neita-Robertson, confirmed that he gave permission to continue the case without him. This means that he could learn the verdict while on his hospital bed. “We went on with the case today (yesterday,” Neita-Robertson said. 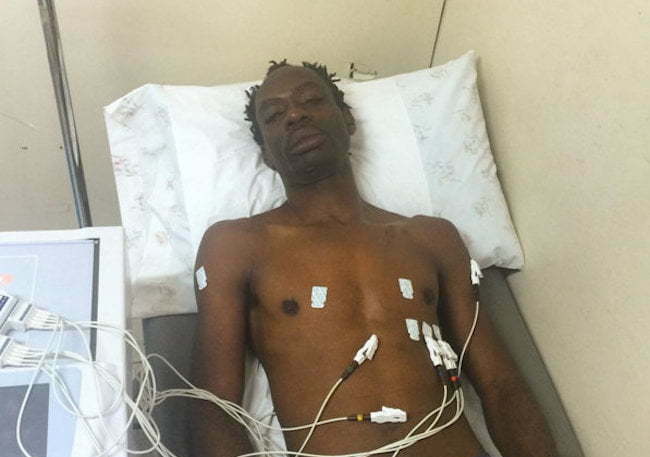 “He has given permission to us to finish it without him.” Ninjaman reportedly started feeling severe chest pain and difficulty breathing while in court on Friday. A foreign-based witness was set to give testimony against the artist before he fell ill. The case continued in the Supreme Court in Kingston yesterday and today. Ninjaman, real name Desmond Ballentine, his son Janiel Ballentine, and another man, Dennis Clayton, are all on trial for the murder and shooting with intent. Cops say the three men shot and killed Ricardo “Trooper” Johnson on Marl Road, Kingston 11, in March 2009. Ninjaman received bail in 2012 but was remanded in custody last month while the trial commences. High Court judge, Justice Martin Gayle, transferred the case to a special court that deals with cases older than five years. This case has seen roughly two dozens mentions and 17 trial delays since 2009. If found guilty, Ninjaman could be sent to prison for life.